Our range of products include pipe pig body. 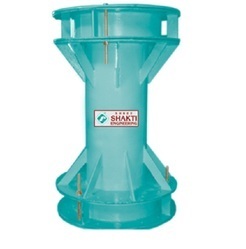 SHREE SHAKTI ENGINEERING is engage in manufacturing and supplying a wide range of pipeline cleaning pig. This superior make cleaning pigs is highly appreciated for its renewed and cost. Pipeline pigs are used maintenance operations inside of pipelines without stopping the flow within the product pipeline in a multitude and application and pipeline pigging can ensure that the lines run smoothly with pig pipe cleaning. Pipeline pigs are maintenance tools that are introduced into pipelines by means of a pig trap which consists of a launcher and receiver. Our offered pig body is checked by our expert professional on our various well defined parameters. Available for a wide range of pipeline diameter. Standard and custom configurations for maximum flexibility. Tough, long lasting original components and replacement parts. Pig can be combined to perform a board variety of function.